Have you ever watched a top dressage rider competing and marveled at how smooth and effortless everything looks? That harmony and fluency come from systematic schooling, correct training, and seemingly invisible aids. 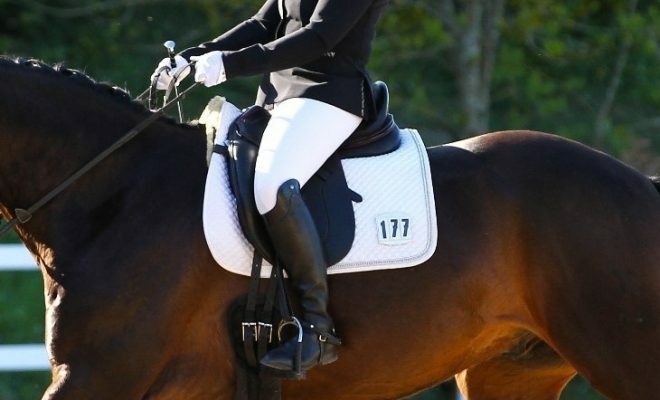 In this article, we discuss how you can refine your aids and watch your dressage scores go from moderate to excellent! Independent aids and your horse’s reaction to them are intrinsically linked. 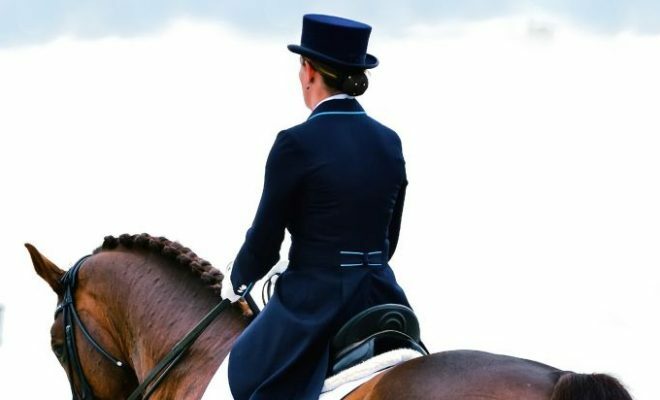 For example, the rider who continually nags at her horse with the background noise of a continually moving lower leg will cause her horse to tune out and have a slower reaction to the aids. 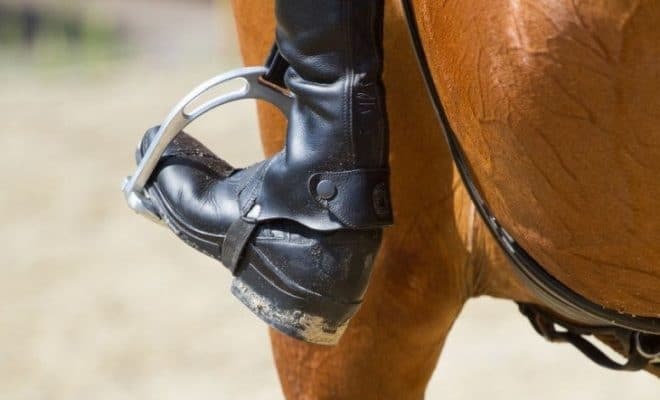 Similarly, the rider who has a stiff elbow and shoulder will typically have hands that are never still, making it impossible to develop an elastic, soft contact with the horse’s mouth. Compare that to the horse whose rider has an independent seat with soft, hanging legs and quiet hands. The horse is reactive and responsive, and the overall impression is one of harmony and fluency. Your horse’s reactivity directly correlates to his development along the Scales of Training. For the horse to work in a good rhythm, be supple through his back, develop an elastic contact, remain straight, and work in a good balance, light, refined aids are essential. 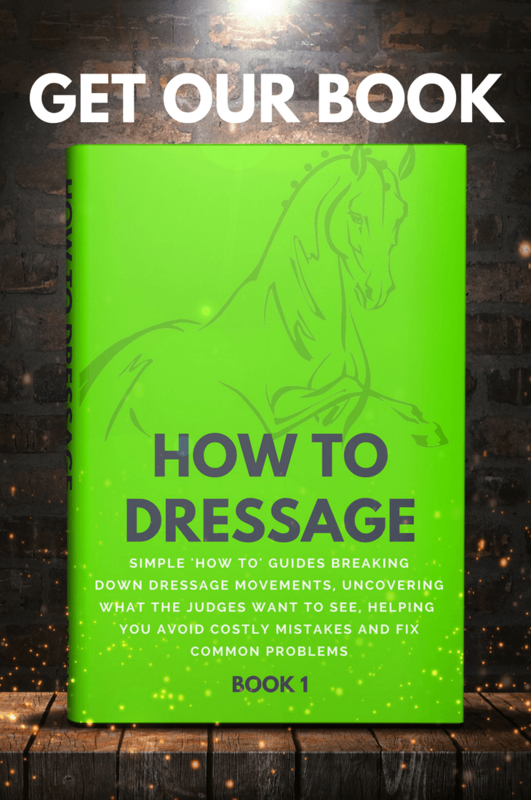 As you move up the levels, the basic Scales of Training must be observed, but the rider needs to become more skilled as she asks her horse to perform more challenging, technically demanding work. The horse’s physical strength and mental understanding will determine how reactive he can be to his rider’s aids. The higher up the levels you go, the more reactive the horse should become. The degree of reactivity you can achieve at the lower levels will not be sufficient when you progress to working with a higher degree of collection at the more advanced levels. So, essentially, the horse’s degree of reactivity should improve in tandem with his development along the Scales of Training. As we’ve already mentioned, if a rider’s aids are too “loud,” she runs the risk of her horse not hearing her clearly. So, heavy, harsh, nagging aids will block the horse from working fluently and smoothly because your signals become lost in a torrent of background noise. If you use very subtle, refined aids, you will be able to “whisper” your request to the horse. If he doesn’t respond, you can “shout” a correction, and then whisper again. Remember that your aids shouldn’t just become louder and louder. For the horse to react to a small aid, he must be schooled to respond to subtle signals. If the horse doesn’t react, you must make a quick but effective immediate correction. The aid and the correction should not sound the same to the horse. The first aid must be quiet and subtle, and the correction must be louder and more forceful. After administering a corrective aid, you must always retest the small, subtle correction. If you don’t do that, you will inadvertently teach your horse to only respond to the louder aid. So, how “loud” should your corrective aid be? A useful way to gauge the volume of your aids is to apply a scale of one to ten, one being the quietest whisper and ten the loudest shout. If you ask your horse to move from halt into trot, start with using an aid that is a three on your volume scale. If the horse is slow to respond, you should correct him immediately with an aid that is five or six on your scale. Now, go back and retest the aid at a three. Hopefully, your horse will be listening more closely, and you will only need to use a two. As soon as your horse reacts, your leg and seat should quietly follow the movement. If you stick to using this formula, you won’t get into the habit of chasing your horse with louder and louder aids in an attempt to get a sharper transition. What’s the best way to give a louder aid? A louder aid used as a correction could be a sharp kick with your heels or a touch with your schooling whip. The horse must learn to be in front of your whip just as he is taught to be in front of your leg. The horse should accept the whip as a tool, not as a punishment. A touch with the whip behind your leg reinforces your leg aid and should be received by the horse quietly and without resistance. 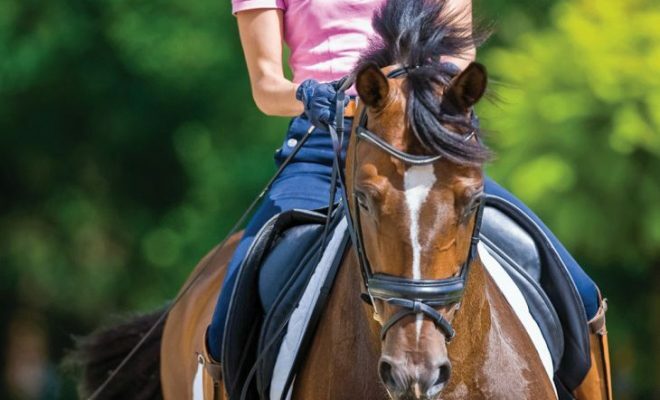 To practice making your horse more reactive to your aids, you’ll need to start with a simple exercise, for example, walk-halt-walk transitions. In halt, sit still and relax. 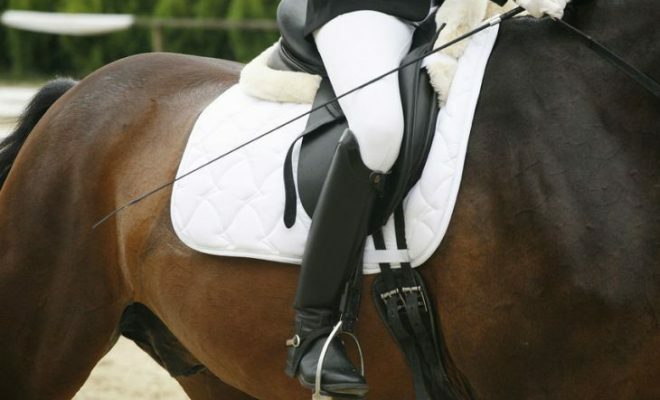 Allow your legs to hang down passively along the horse’s sides. There should be no pressure or squeezing, just sit quietly. Now quietly ask the horse to walk on by closing your calf muscles onto the horse’s sides. That’s a three on your scale. The horse should react immediately but not abruptly and without tension. If the horse ignores your aid, back it up with a quick, sharp kick or touch with your whip. That’s a five on your scale. When the horse responds, repeat the exercise, using your three aid again to ask the horse to walk forward. If your correction was effective, the horse should give you a more reactive response to the quieter aid. When we talk about aids, we automatically think of the legs and the hands, but your seat plays an important part too. Once you have developed a good passive seat that can follow the horse’s movement, you can then use your seat to influence the horse. Your seat should work in tandem with your subtle leg and rein aids. 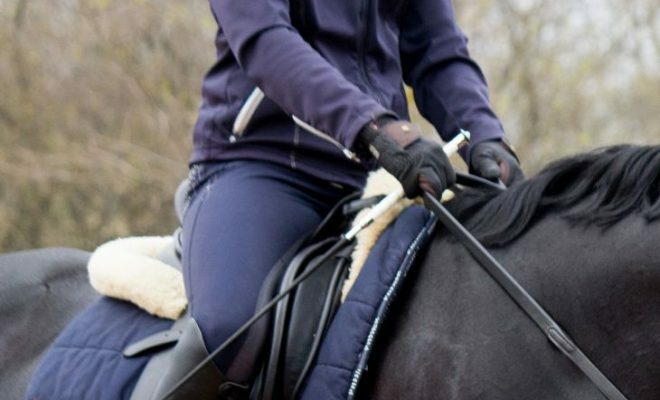 With systematic training and repetition, you will be able to ride more from your seat and, therefore, make your leg and rein aids quieter and more invisible. If you want to emulate the elegance and invisible aids used by top riders, you will first need to teach your horse to be more reactive. When the horse is sharp and responsive to light aids, you will be able to sit more quietly and refine your signals. Did you try the exercises we suggested in this article? If you did, we’d love to hear how you did! Is your horse now super-reactive? Tell us about your experience in the comments box below.